A huge Devil May Cry 5 leak has surfaced with details on its release date, development team, gameplay, characters, and more. The leak was posted by ResetEra user ‘Son of Sparda’, who is said to have accepted full responsibility for its contents, and has accepted a permanent ban from the forum if the leak turns out to be fake. o The game is slated to release some time in the fiscal calendar year of 2019. That means sometime between April 2018 and March 2019. Original plan was to release it in November 2018 but the date MIGHT have been pushed back to early 2019.
o Originally DMCV was intended to be announced at PSX but after receiving feedback on their E3 press conference, Sony decided to scale back on PSX and instead scale up E3 2018. DMCV was an unfortunate casualty of this choice and thus it’s unlikely that DMCV gets officially revealed in 2017.
o There will be a demo for the game sometime before release. o Game has been in development for 2 years as of today. When it will release it will have been in development for 3 years at least. That is actually the highest time a DMC game has been in full production for. Pre-production started as early as 2015 around the time that DMC4SE finished releasing. There have been no development hiccups and as stated, the development has in fact been progressing smoothly. o There is some form of Playstation exclusivity involved. Sony is paying for some of the funding for the game but the extent of it is not known. Could be completely PS4 exclusive, console exclusive or timed exclusive. If the game is announced publicly then it will be at a Sony event, which is why many people thought that it was going to be at PSX. o Trailer has been ready for a while now. The initial trailer is 1 minute 50 seconds long (they may add new cuts to trailer to make an extended version since some time has passed from when it was made). It is mostly focused on story, characters and cutscenes. A city like setting is shown in the trailer not that different from Fortuna city in DMC4. o The overall game is supposed to be “ambitious” for a DMC title with a broader appeal. o Longest cutscene runtime of any DMC game yet. o Itsuno’s team that worked on previous DMC games and Dragon’s Dogma is working on DMCV. o Yuji Shimomura is returning as the cutscene director for DMCV. He worked on DMC3, DMC4 and Bayonetta cutscenes. o Rueben Langdon is reprising his role as Dante. o Johnny Young Bosch is reprising his role as Nero. o Dan Southworth is reprising his role as Vergil. o Onyay Pheori is helping with the soundtrack (she did the song for DMC4SE’s launch trailer). o DMCV picks up the story after DMC4. o More than one playable character in the game, Dante is for sure playable and Nero is possibly playable as well. Up to 3 playable characters have been suggested for now. o This is the most serious Dante has been (a “new side” of Dante), of course not counting DMC2. Dante still plays with his enemies and has his usual over the top flair but this game is going to be more personal for him. o A third character is expected to be playable as well. Said to be “very powerful.” May or may not be brand new to the series. o No word on whether Vergil is playable or not, he will be returning although specifics on how he is returning from his death in DMC1 are unknown. o Trish has a prominent role to play in DMCV but no word on whether she is playable or not. o There will be a sequence where Nero and Vergil have a confrontation, confirming their relationship (Nero is in fact Vergil’s son as stated in the DMC3142 artbook). o Characters switch during key story points in the game. o DMCV might be the end of the “sons of Sparda” storyline. o Hard lock on is standard. 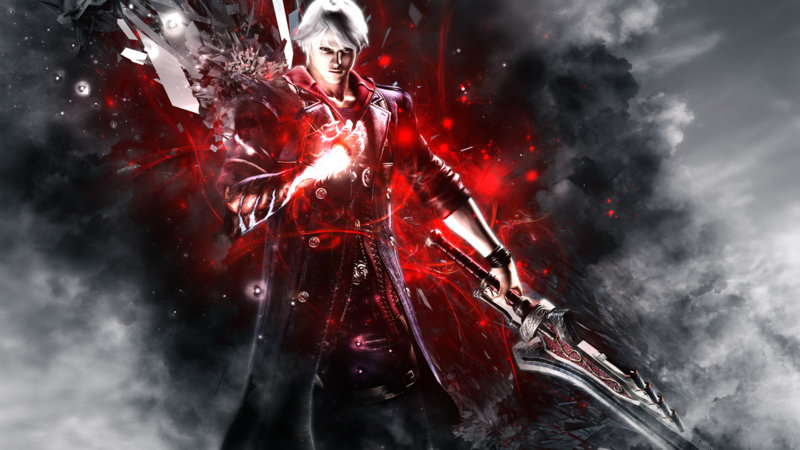 o Console is targeted for 60 frames per second like the previous DMC games. o Level design is more open than previous DMC games but not going into Souls or open world territory of level design. Movement outside of combat has been streamlined to match the open nature of the game. The structure is more open to make the experience more “smooth.” Immersion is important to the team with this game. o Level design and exploration is more similar to Bayonetta with action set pieces thrown in there but without the QTEs. QTEs in general do not exist in DMCV thus far. o There is NO Stamina bar. o This is not a Musou game but there will be encounters where you are facing more enemies than you are used to in a DMC game. o There is some online integration but definitely no multiplayer PvP. o Dodge system is reworked and dodging in general is supposed to be a lot smoother than before (get ready to hear the word “smooth” a lot when related to DMCV). o Camera pulls back during big fights. The devs are really proud of the new, more dynamic camera system. o Animations are being improved to be less stiff. Big emphasis on cloth physics (maybe Dante’s sword might not clip through his jacket now!). Battles are beautifully animated and smooth. o Mission and Ranking system similar to previous DMC games and Bayonetta. There will definitely be mission/chapter selects. o Bosses being ramped up dramatically in DMCV. One of the boss fights moves between multiple areas of the game. o Style system is in for Dante – Enemies will react a bit differently to each style. o Style system has been streamlined to be smoother to use for the players (speculated that the style system might be tuned/reworked to make it easier to get into than in DMC4). o Certain styles will have advantages on certain enemies similar to DmC/DMC3 (you can use a single style on any enemy just fine). o More environment interactivity than any previous DMC game. This is supposed to compliment the combat system, not detract from it. o There is some form of dynamic environment destruction/transformation in play but not on the scale of DmC thus far. o While this is not an open world game, some inspirations have been taken from Dragon’s Dogma. The first Devil May Cry installment was released for Sony’s PS2 back in 2001. Devil May Cry 4, the latest title in the original DMC series, was released in 2008 for PS3, Xbox 360 and PC.